Necessity is the mother of invention …. Have you ever heard that saying?! How true is it?! I mean, really?! This Small Batch Fudge was an invention of necessity … It took three tries to get it right – and now I’ve got it for those times when I need a chocolate fix quick! The other night, I wanted something …. I wasn’t sure what exactly, but it had to be chocolate. I know y’all know how that is! Y’all know those meme’s going around about raiding your baking stash ….. that was totally me! I thought to myself that I probably looked ridiculous walking between the pantry and fridge for any kind of chocolate …. I spotted some chocolate chips – about half a bag. I could have just taken a small handful and called it good …. but I wasn’t really satisfied with that idea. I really wanted it to be something else. I spotted some mini marshmallows too …. and that’s when I had the idea to try to make just enough fudge for me …. and Brian. I’m pretty sure he would have thought it rude if I didn’t at least offer him some! LOL. The first batch was, uh … not so pretty and almost inedible. Ok, it was gross. The second batch was getting better – and this batch (I’m sharing today!) was almost spot on! You could reduce the amount of sugar a tad if you find it to be a bit too sweet for your liking. I also spooned mine in a ramekin after I microwaved it in the coffee cup because I wanted a more flat fudge than the coffee cup allowed. If you don’t mind a taller fudge, by all means, save yourself the extra dish and just keep it in the coffee cup! You can do it however you like! 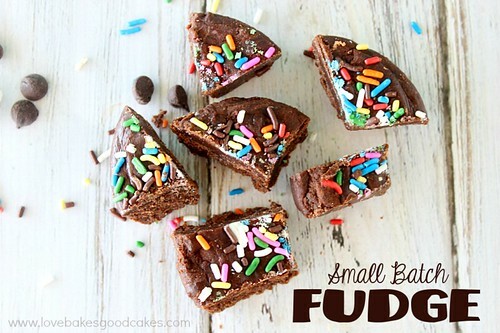 I used sprinkles to top our fudge because it was 1) easy 2) they were in my pantry 3) sprinkles are fun …. but you could use most anything you like in fudge! Although I haven’t tried it yet …. I am guessing you could use different flavors of chips to make different flavors of fudge! So really, this is like I’m sharing unlimited recipes in one! Place the chocolate chips in a microwave-safe coffee cup. Add the sugar and butter. Microwave on HIGH for 2-3** minutes. (I microwaved mine for 2:30). Remove the coffee cup from the microwave using an oven mitt. Add the marshmallows to the cup; stir until the marshmallows are melted and the mixture is thoroughly combined. Let mixture cool for about 3-5 minutes, then refrigerate for 10-15 minutes or until the fudge is set. Run a butter knife around the edge of the fudge. Remove from the cup. Cut into pieces. *Please note – You may need to adjust the cook time depending on your microwave. Delish …. and just what I needed. Hi Jamie! 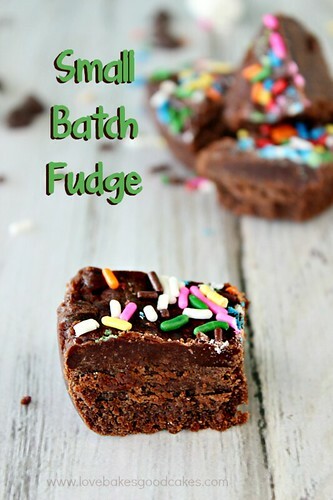 What a great recipe for a fast chocolate fix and I love the ecard! I can totally relate – I've seen my hubby hit the bottle of Hershey's chocolate when he needed a fast fix, lol! Thanks for sharing and pinning! Have a great day and I wish I was out near you right about now – we are expecting some major snow here, so tomorrow might be the perfect day to make this! This is genius! 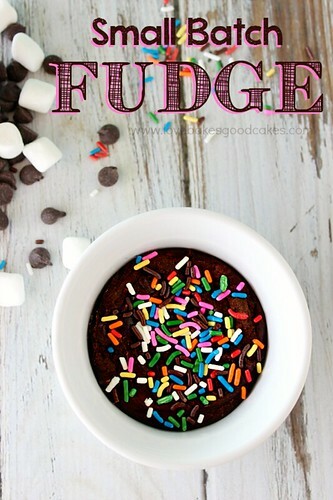 I'm always searching for a chocolate fix and this will be perfect! Pinning! Thought I would come back and let you know we gave it a go and posted about it (with a link back to you, of course!) – Here is the post if you want to have a look! http://joandsue.blogspot.ca/2014/02/5-minute-small-batch-chocolate-peanut.html It was sooooooo tasty! A little trouble with the cooking time but we got that figured out and it worked great. I won't have an excuse the next time a chocolate craving hits. Thanks for sharing at Inspire Us Thursday on Organized 31. This is absolute genius! Love it! Jamie, I just love this fudge recipe, thanks so much for sharing it with us at Full Plate Thursday! I am such a bad girl when it comes to fudge so I need this small batch to keep me from going wild! You cannot go wrong with fudge! 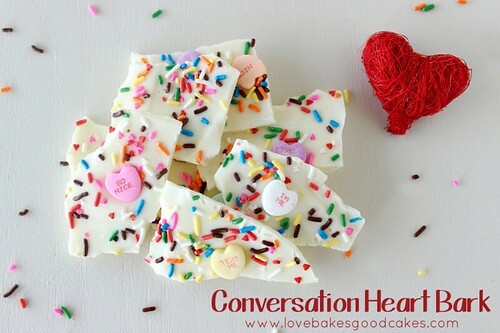 And this recipe looks delicious (plus I am a big fan of sprinkles :)) Thanks for sharing!! Very familiar with those evening chocolate cravings. When it comes to chocolate (and sweets in general), I think small batches are best. I have no self control! Thank you for linking, Jamie. My daughter is so into making little cakes etc in the microwave. She is going to love this recipe. Thanks for bringing it to foodie friday. What a great idea – my sons would love this. What a fabulous idea!! 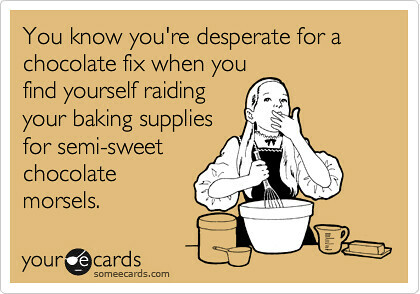 I love that ecard because that is totally what I do when I need a chocolate fix! This is the perfect size of fudge. Love it! Thanks for sharing on Saturday Night Fever! Pinned! Oh dear Jamie! Having a small batch recipe for fudge can be a dangerous thing for me, lol. Thanks for sharing at Simple Supper. 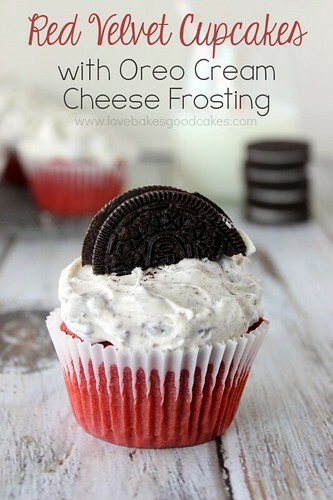 This looks perfect for my after dinner sweet tooth cravings or just about any sweet toothed craving. This is one of my favourites on Sweet and Savoury Sunday! Make sure you stop by, grab a button and link up again this weekend!